Stein Reheating Walking Hearth Furnace (WHF) reheats round or square billets and blooms, offering operational flexibility and ease of use. The heavy-duty Stein Reheating WHF from Fives is a flexible alternative to the pusher furnace. In this type of furnace, products are moved inside the furnace by means of the walking movement of the hearth. It is the ideal solution for heating small cross section billets, but is capable of handling round or square billets and blooms from 20 up to 180 t/h. This furnace can be used to process carbon, alloy, stainless or special steels and it is easy to operate. The Stein Reheating WHF is defined by the walking hearth hydraulic mechanism, which moves the product in a rectangular cycle through the furnace. The movable and stationary hearths are covered with a proven refractory material that ensures reliable operation and long refractory life. The walking hearth furnace also features an aligning machine and kick-off machine for side charging and discharging, as well as the possibility of skid design on the charging side to reduce billet bending. With good temperature uniformity and the capability for cold and/or hot charging, as well as the inclusion of the Virtuo® thermal solution for Level 2, Stein Reheating WHF offers the best operational flexibility. The main advantage of this furnace is the accurate temperature homogeneity in the products of +/- 7.5˚C at a discharge temperature of 1250˚C for a 15m long stainless steel billet. The special design of the walking hearth enables the reduction of black spots on the bottom face of the products. 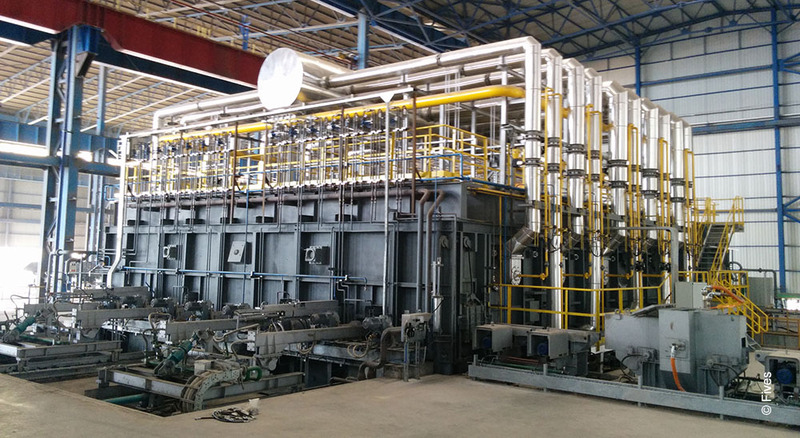 The furnace is installed in the company’s Izmir factory as part of a rolling mill modernization project, replacing an existing pusher furnace to process a wide range of billet sections and blooms, as well as short and long products in either one or two rows. The maximum product weight is 3.7 tons with nominal discharge temperature reaching 1200˚C. The Siam Construction Steel Co. (Tata Group) entrusted Fives to revamp the existing fuel oil-fired reheating furnace combustion equipment. As a result, the plant benefited from reduced NOx emissions, simplified control of the furnace heat up and accurate temperature homogeneity on the product section. 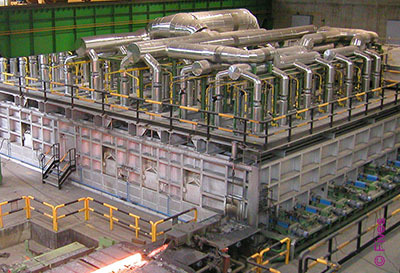 Bascotecnia Group entrusted Fives with the supply of one new 80 t/h walking hearth furnace for billets. This new furnace includes burners designed to fire heavy fuel oil with high temperature preheated air, as well as three combustion control zones that allow the billet to be heated to the desired discharge temperature of 1100°C. A cost-effective solution that enhances the metallurgical properties of the steel grade and reduces emissions while meeting the quality and performance criteria.